We are glad you found Awesome Entertainment! Imagine a Los Angeles disc jockey and Master of Ceremonies with the experience to move you. Text or Call Anytime: 626-319-3259. Mark Peace Thomas, Owner / MC / DJ / Author / Songwriter. Full Service DJ, MC and Audio/Visual Services. Three Decades of Peace, Love and Fun Celebrations! Cick Here for KINDLE EDITION of the bridal planning book: "Awesome Wedding Ideas". 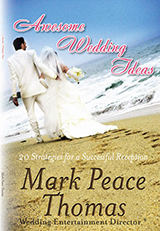 Click Here for Paperback Version of the wedding planning book: "Awesome Wedding Ideas". Get playlists and hear original music. We handle Corporate Events, too. 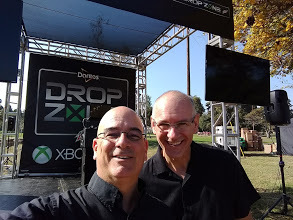 MC: Mark Peace Thomas (on the left) with DJ Tech: Mike K. Brown as they give away "X-Box One Gaming Consoles" for "Doritos and Dew" contest. Event booked through Jeff DiDomenico. Founded in North Hollywood in 1989. 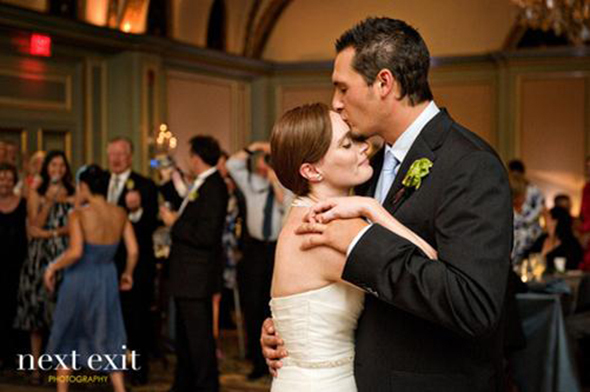 Relocated to Pasadena and currently a Temecula disc jockey for music and event planning services in Southern California for your wine country wedding or we are available to travel anywhere in the United States and Internationally. Master of Ceremonies Mark Peace Thomas owns and operates Awesome Entertainment. © 2003-2018 Awesome Entertainment. All rights reserved. Wedding Planning, Event Planning and disc jockey musict serving Southern California including Burbank, Pasadena, Covina, Arcadia, Anaheim, Long Beach, Laguna Niguel, Rancho Palos Verdes, Westlake Village, Glendale, Los Angeles, Buena Park, Irvine, Huntington Beach, Laguna, Laguna Niguel, San Diego, El Cajon, La Jolla, Santa Barbara, Ventura, Valencia, Santa Clarita, Pomona, San Bernardino, Riverside, Commerce, La Habra, Industry Hills, Baldwin Park, Mission Hills, Northridge, Reseda, Orange County, Riverside County including Temecula, Canyon Lake, Lake Elsinore, Corona, Norco, Fallbrook, SanDiego County, Newport Beach, Huntington Beach, Laguna Beach,Pacific Palisades, Inland Empire, San Bernardino County, Ventura County. Wedding dj's are available to travel. David Tutera, My Fair Wedding, WETV. Your perfect wedding dress, tasty food, beautiful bridal bouquets, wedding photography and reception videographer is an investment that your wedding DJ service can protect and enhance. Bi-lingual disc jcokeys, Black disc jockeys, African American disc jockeys, International disc jockeys, Wedding disc jockeys for the best wedding reception ever. DJ Peace is a registered trademark.